While we still think AutoAssign is the best way to create simple rules for assignment of ClearContext Topics and Priorities, in IMS v3.1.0 we also provide preliminary support for the creation of Outlook rules to provide this functionality. This enables power users to craft more complex scenarios to assign topics and priorities using custom actions within Outlook rules. 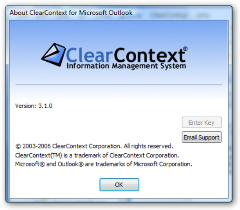 A beta version of the ClearContext Outlook Rules extension is available for download here; along with complete instructions for use. Give it a whirl and let us know what you think. Posted by brad at 5:05 pm on March 29th, 2007. We’ve added three new action buttons to the Inbox Alert Windows Vista Sidebar Gadget. 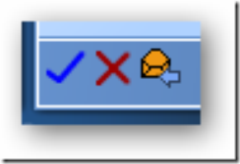 Now you can Mark Read, Delete or Reply to the message you are previewing (Outlook 2007 only). We haven’t posted to the Windows Live Gallery site yet, but you can grab it here. See our gadget page for more detail. 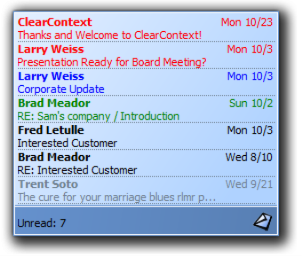 We are pleased to announce the v1.0 release of our new Windows Vista sidebar gadget, ClearContext Inbox Alert for Microsoft Outlook. The gadget displays unread Inbox messages and, if you are running ClearContext IMS, allows you to color-code, sort and filter by priority. Check it out on the Windows Live Gallery. We’ve got several resources online if you want to learn more about the gadget. Our gadget page explains the advantages of running it with ClearContext IMS installed. We’ve got a comprehensive User Guide describing gadget functionality, and our FAQ covers various system requirements. Finally, if you have feedback or questions about Inbox Alert, post them on our forums. Did you see this this excellent article in the New York Times? The gadget is a great way to give yourself focus on the work at hand without missing really important messages. Turn all of your new mail notifications off and configure the gadget filter to show Very High priority messages only. Inbox Alert will only display your important messages and you can get to the less important ones when you have some free time. To turn off notifications in Outlook, go to Tools > Options > Preferences > E-Mail Options > Advanced E-mail Options and uncheck every item under “When new items arrive in my Inbox.” Honestly, you should do this even if you aren’t running the gadget. You can thank me later for the productivity gains! Posted by brad at 6:55 pm on March 26th, 2007. As part of our v3.1 release, we have worked with Michael Linenberger to implement several new views in the Total Workday Control enabled version of ClearContext. In particular, we have implemented a new To Do Bar view to port the TWC TaskPad to Outlook 2007. If you haven’t yet checked out TWC and you’re looking to get a handle on your daily tasks, I highly recommend you check out Michael’s system. He has posted a ton of information on his website, including a great guide to getting started with ClearContext and the Total Workday Control system and step by step instructions for transitioning the TWC system to Outlook 2007. For more detail and a link to the TWC/CC download, see our partner page. Posted by brad at 3:58 pm on March 20th, 2007. If you previously installed v3.1 when it was released a couple of weeks ago, there is no change between the functionality of that release and this one; you do not need to update your install. We did change the installer, so our Vista Admin customers running with UAC turned off will no longer need to make a separate download. If you’ve been waiting for the final final v3.1 release, download and install it now – I think you will find the new features very useful! Posted by brad at 12:09 pm on March 19th, 2007. Thanks for all of the great feedback we have gotten on the new ClearContext sidebar gadget. We have posted a beta refresh of the gadget here. We now support Outlook 2003 and 2002 (XP) users who are running IMS v3.1.0 or greater. The connection to Outlook should be more reliable and we’ve polished up the UI. We’ve also resolved an Outlook shutdown issue that was tied to the receipt of non-mail items (i.e. task requests). This release contains standalone support. If you have friends who are running Outlook 2007 but haven’t made the leap to ClearContext IMS yet, please forward this gadget to them. Much like the ClearContext-enabled version, the gadget displays unread Inbox messages and allows message previews without opening Outlook. Due to technical restrictions in Outlook 2003 and earlier, the standalone version of the gadget is available for Outlook 2007 only. Please post feedback on the gadget in our user forums. Thanks again for your help. Posted by brad at 4:27 pm on March 12th, 2007. Enhanced Automated Filing – Taking advantage of the v3 Topic Selector, file messages buttons now allow automated filing of any message, regardless of whether or not a Topic is currently assigned. Improved AutoAssign Management – We’ve implemented a new AutoAssign Management dialog to make it easier to manage long lists of AutoAssign rules. Now you can sort by rule name, parameters, actions, etc.. Global Follow-Up – Now for any email message, automatically create a reminder if you don’t receive a response within a certain time. Open RelatedView – 2007 users can now click the open button on the integrated RelatedView to launch a larger RelatedView window. New Total Workday Control Views – we have added some new views to our TWC enabled version of ClearContext, including support for the Outlook 2007 To-Do Bar. More details and a link to this release will come in a future post. UPDATE: Download the TWC enabled version of v3.1.0 here. More details to come on the new views upon formal release. We have also implemented many functionality and performance enhancements throughout the product; too numerous to mention here. I will be updating our user forums with the details a little later. UPDATE: The detailed list of enhancements is located here. Early access to v3.1 is available here and is a free upgrade for all registered v3 customers. (Windows Vista users running as an Administrator with UAC turned off should download this one). We’ll roll this out to the main site after we get everything else that goes along with a release (documentation, website updates, etc.) pulled together. UPDATE2: The main site has been updated and we have rolled the release to the general public. I have changed the download links on this post to point to the final build. The new installed eliminates the need for a separate Vista Administrator/UAC off download. With v3.1 we have implemented a backend to support our upcoming Vista Sidebar Gadget. The gadget displays unread Inbox messages as they are received for a quick review of unread items. It can be sorted and filtered by priority and allows a quick preview of the message without the need to open Outlook. The gadget works with both IMS Professional and IMS Personal. This is a work in progress; if you are running Windows Vista and would like to try an early version of the gadget, see our gadget page. We are anxious to hear what you think about our new releases; please post your feedback in our Features and Support Forums. We’ll post additional information about the releases as well as our future product plans here on the weblog in the coming weeks.